Three quarters of the way through March, I received my very lovely copy of Dux Brittaniarum, from the nice chaps at Too Fat Lardies. A quick read through reveals its all pretty straighforward, especially as Griping Beast are finally releasing the generic Dark Ages plastic mini's I will need for the unarmoured part of my Sub-Roman army. A bit of luck with a pack of West Wind armoured Sub-Roman spear will add to these to make a cheap Sub-Roman army! Now, for some of the very nice pre-planned games (farm raid and village raid) that the rules include, I need... a farm and a village! My well-stocked terrain box has plenty of Dark Ages terrain, but a quick count up revealed a problem! 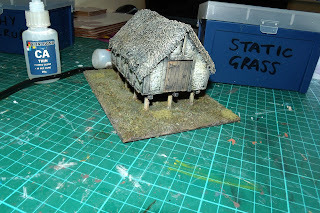 A "farm" for game purposes, is a minimum of three buildings, and a "village" is a minimum of four, plus a bit of fence. Even my arithmetic could work out that two houses do not a Sub-Roman farm or village make. 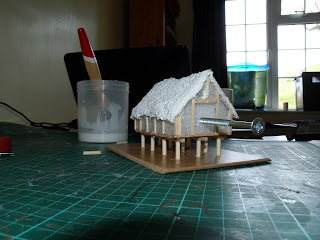 Ironically with the houses, plus a church, great hall and grubenhauser, I could make a fully functional Saxon farm or village! Since I am obviously psychologically incapable of refusing the chance to build terrain models, the solution was obvious. So for now my grand plans for the Wansdyke and South Cadbury are on hold, while I build a granary, a pig sty and a storage shed / barn. Oh, and a length or two of fence! 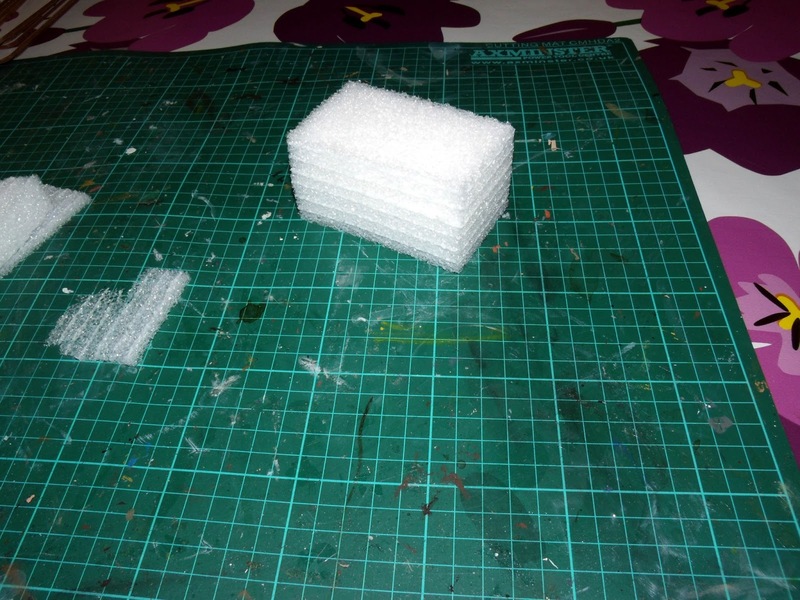 All three of these are relatively small structures, and lend themselves to being made from solid foam blocks. I'll build them in the same order, granary first, then pig sty, and finally the barn. I'll fit the fence it somewhere! 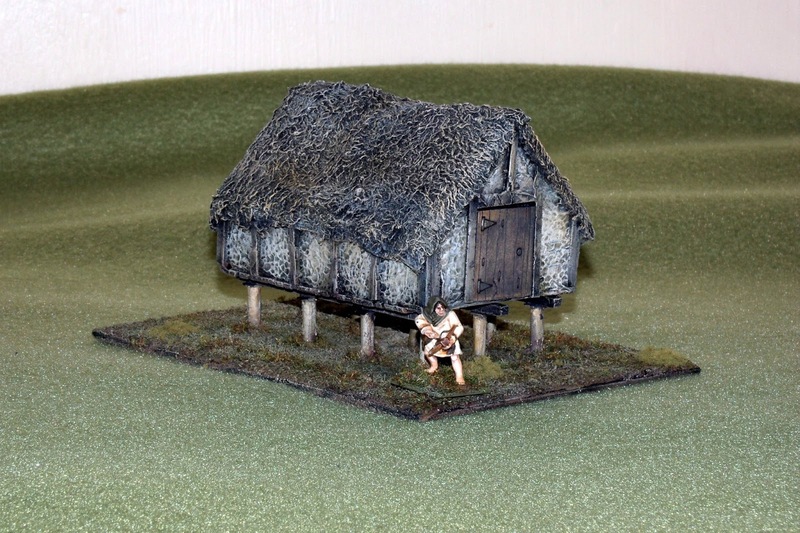 Granaries were pretty standard structures, and every village or farm would have had at least one. They were typically mounted on posts or stilts, which were (crucially) set so that the building overhung them. This kept the grain off the ground, and made it less susceptible to damp or heavy rain running in, but also helped to keep out rodents. With the posts set inside the line of the building, a mouse or rat would have to climb up the post (easy enough), then crawl while hanging upside down to the edge of the building, which whilst perhaps not impossible, is pretty tricky. Make a cutout at one end for a door. Note there are no windows. A thatched roof would make the structure sufficiently breathable. 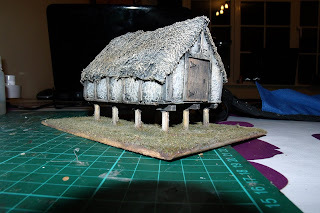 Coat the walls with whatever suits your preference to represent wattle and daub (in this case paper) and add the timber framing. 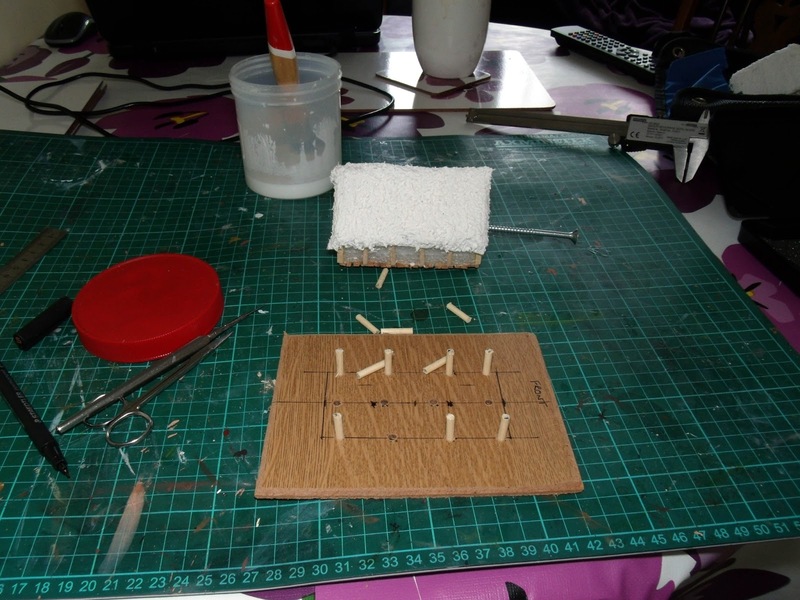 Glue strips of wood (coffee stirrers, basswood or balsa, according to your preference) to the base. 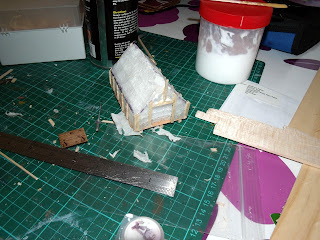 I went with two layers, a transverse set, and then three more running front to rear slightly inside the building edge. Rafters go one next. A bit of overhang lets the roof fit nicely. 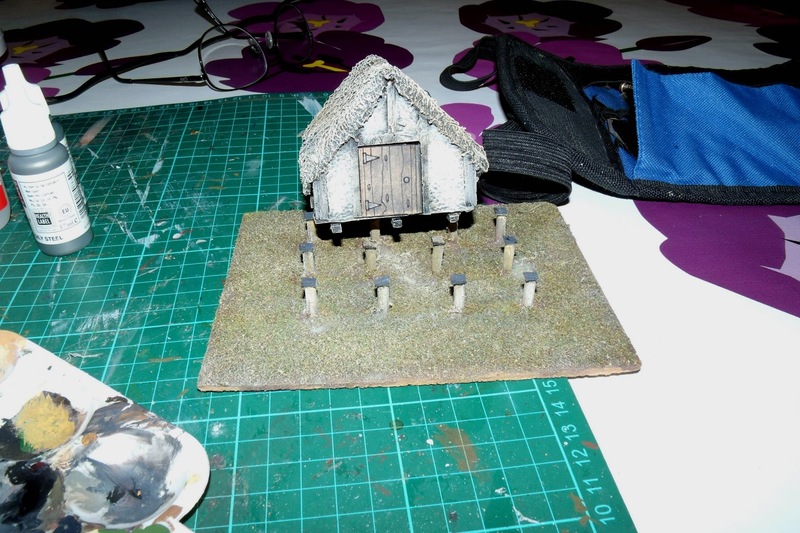 These are followed with the thatch, made as usual from towelling and PVA. A large woodscrew crowded in through the doorway makes a useful handhold at this stage. Now, here's the clever bit (don't get too excited!). 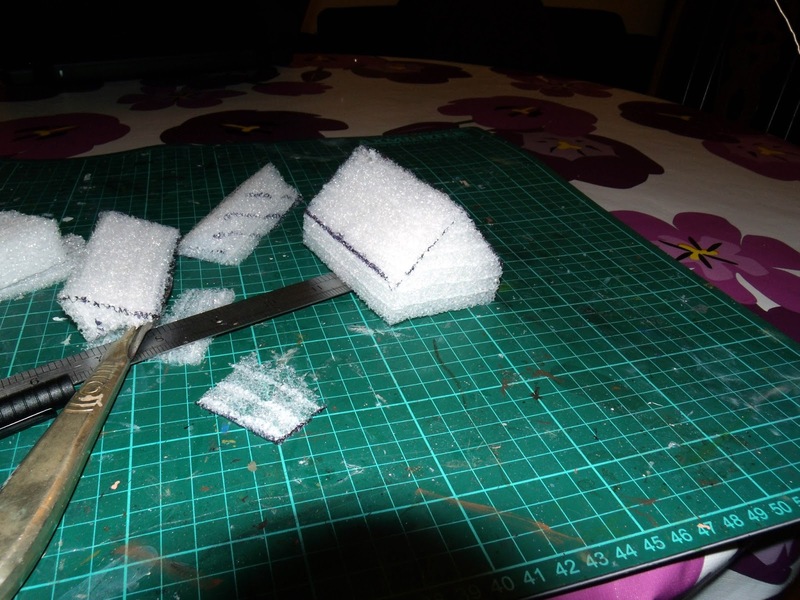 Cut your base from whatever material you feel will best suit (this is 3mm hardboard - horrible stuff, this is about all it's fit for). By careful reference to your building, mark the position of the stilts onto your base. Then make your stilts and glue them to the base. These want to be about two to three feet high in scale, and sufficiently thick to look as if the will actually hold the building up when it contains several tons of wheat and barley! Again, timber is the obvious material, but there is evidence for the use of carved stone, certainly later on. Glue your stilts onto the base, making sure that they are even and level and the store actually sits on top of them! 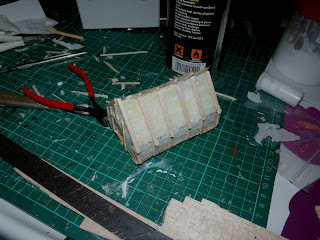 Add some squares of plastic card to the tops of the stilts, giving a bit of overhang. These would have been slate, stone or split timber, to help keep the mice out. Then sculpt your groundwork. Why not make the store, glue the legs to it and then glue the whole thing down, you ask? Well, if you do that, how do you sculpt the groundwork under the store? And, if you glue the stilts to the store and then sculpt the groundwork, what do you do when all the stilts don't touch the ground? There, I told you it was clever, didn't I? Note the stilts all DO touch! So, paint the two parts according to your preferred method and colours, and sort out your groundwork with flock. 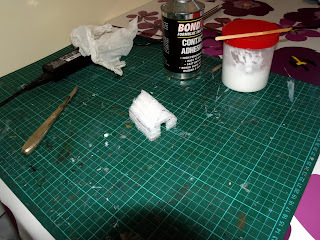 Fit a suitable door, either home made, or one from the nice chaps at Warbases, as I did here. 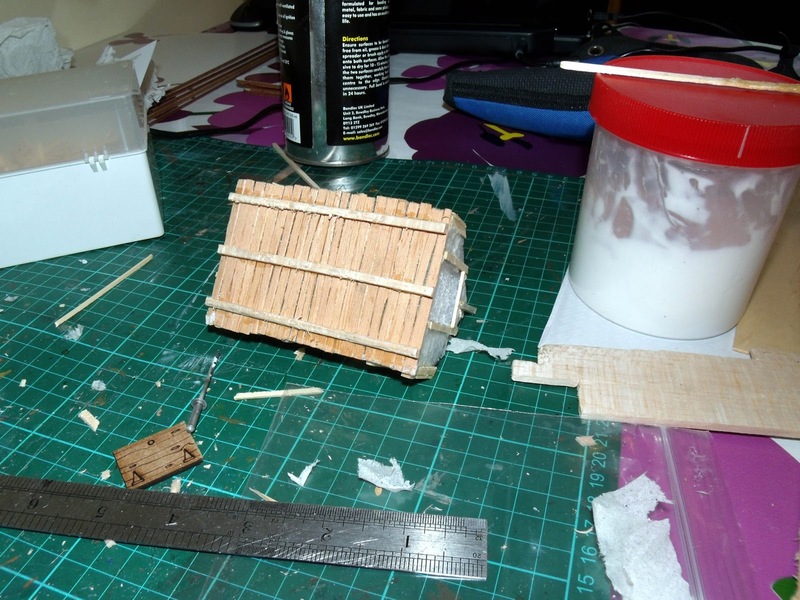 Now, glue the completed store to the stilts and tidy up / weather the joined areas. The stilts still all touch! I gave mine a coat of gloss polyurethane for protection, followed by two coats of W&N Galleria matt through the airbrush. Now add any tufts, tussocks or static grass, especially around the bottom of the stilts, where long grass tends to not get trimmed back. Job done! 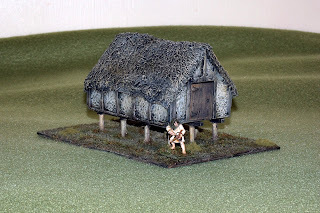 Grain stores like this, with fairly minor changes of design, were in use for centuries before and after the Sub-Roman period, so a structure like this will give good service across ancients, medieval and even Renaissance games. On the table. MDS Pictish raider for scale. Cheers Sean, glad you enjoyed it! Thanks. This is a cool idea. Basing it on stilts is a nice touch. I will have to try this out. I like it, painting is very effective.